The standard for service and business excellence. The Hospitality Assured Certification for the Caribbean for which the Caribbean Tourism Organization (CTO) holds the license, seeks to actively encourage tourism and hospitality businesses in the region to put in place a service quality framework that meets the requirements for the European Foundation for Quality Management Excellence Model. The Hospitality Assured process encourages businesses to look at their own operation from the customer's perspective and to see where improvements should be made to benefit the customer and strengthen the business. The Hospitality Assured 9-Step Framework provides the framework to achieve service and business excellence. The Caribbean Development Bank (CDB), through its Caribbean Technological Consultancy Services (CTCS) Network, is utilising the Hospitality Assured (Caribbean) Certification programme to significantly improve service quality standards and build a culture of service and business excellence in the region’s micro, small and medium-sized operations (MSMEs) in the tourism and hospitality sector. 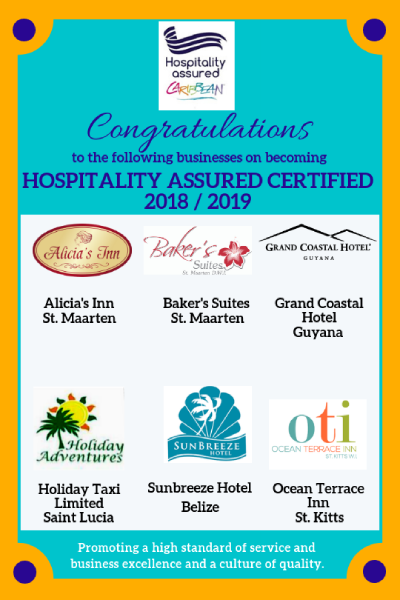 Through the provision of US$223,312.00, over a one year period, the CDB is supporting two key components of the Hospitality Assured (HA) Caribbean certification programme, managed by the CTO as part of its product development and service quality thrust.